The doors opened to this building in 1990, at a cost of $25 million and entirely debt free. Designed by Gin Wong and Associates, the former Family Life Center served for many years as the Crystal Cathedral Academy. Featuring 132,000 square feet, the third and fourth floors house the Roman Catholic Diocese of Orange Pastoral Center, home to the offices of The Most Reverend Kevin Vann, Bishop of Orange and the ministries of the diocese. These offices were originally located at Marywood in the City of Orange and moved to these new facilities in 2013. The first and second floors are now home to the Cathedral Academy, a state of the art educational facility. Gin Wong and Associates are also known for designing the Arco Tower and Midnight Mission in Los Angeles, as well as working on the futuristic Theme Building at LAX. Housed within the first and second floors of the Pastoral Center, St. Callistus Catholic School was relocated in 2013 to these new facilities and renamed Christ Cathedral Academy. This Catholic school is now accepting new students with classes for preschoolers through eighth grade. Offering innovative curricula from highly trained staff, Christ Cathedral Academy is a state of the art educational facility, featuring a full-sized gymnasium, dance studio, science lab, and more. A peaceful, ecumenical cemetery located in the shadow of Christ Cathedral. The Memorial Gardens were dedicated in 1991 and offer many different burial options within tranquil grounds accented by flowing fountains, beautiful landscaping and majestic art installations. The Diocese of Orange is proud to offer Catholics and those of all faiths and backgrounds a beautiful, serene final resting place. The cemetery will soon expand by three quarters of an acre to provide additional interment space. Named for John and Donna Crean whose contributions helped fund its construction, the Crean Tower was completed in 1990. Designed by Philip Johnson, this stunning 236-foot stainless-steel mirrored spire stands over 18 stories tall and houses a magnificent 52 bell carillon. The Arvella Schuller carillon was named in honor of her 35 years of service in bringing beautiful music to the church. This remarkable collection of bells range from six inches to nearly six feet and were forged by the Royal Eijsbouts Bell Foundry in the Netherlands. The entire carillon assembly weighs 42,000 pounds and was lifted into place on May 25, 1990, by two cranes working in tandem. The bells may be played manually from a room high inside the tower or from the consoles on the great cathedral organ. Just below the tower is the Mary Hood prayer chapel, named for the wife of the late Clifford E. Hood, former President of the United States Steel Corporation, who made the chapel possible with a gift of $1 million dollars. The chapel is a circular structure set with 33 solid, multi-colored marble cylindrical columns, representing Jesus’ 33 years of life, and 12 white columns representing the 12 apostles. A bronze plaque on the floor seals a prayer capsule located beneath the altar that contains 33,000 unopened prayers received from around the globe, representing future generations. The chapel has no lock, as Reverend Schuller wished that it would be open to all for meditation. Originally known as the “Welcome Center,” the Cultural Center was completed in 2002 at a cost of $825 per square foot and was designed by world renowned architect Richard Meier, also known for his commission of the Getty Center in Los Angeles and the Jubilee Church in Rome, Italy. This five floor, 53,056 square foot building is the capstone of the iconic Christ Cathedral campus and is a post-modern expression of Richard Neutra’s original design concepts. It was built in an ovalinear design in order to geometrically complement the existing rectilinear architecture of the Arboretum and Tower of Hope and the triangular layout of the Crystal Cathedral. In 2013, the building was featured as Star Fleet Command in the film “Star Trek: Into Darkness” and the interior was used in several scenes throughout the movie. The lower level houses an indoor/outdoor reception area and the state-of-the-art 298 seat Freed Performing Arts Theatre featuring upgraded surround sound electronics and a movable orchestra pit. This theatre is available for rentals and has welcomed movie premieres, theatrical presentations, concerts and other special events. In the future, the upper floors will house world class art and spiritual exhibits and offer many cultural events to the community. A restaurant, bookstore and gift shop is planned for the main level. The newly renovated offices of the Cathedral Parish, Cathedral Ministries, and upcoming home of EWTN and Immaculate Heart Radio. Designed by Richard Neutra and his son Dion, the 13-story Tower of Hope first opened in 1968. Named after New Hope Ministries, this building housed the very first 24-hour suicide prevention hotline (714-NEW-HOPE), which today continues under the auspices of Catholic Charities of Orange County. The Tower of Hope has undergone a $6-million renovation and seismic upgrade and houses the offices of the Cathedral Parish and Christ Catholic Cathedral Corp., the entity that manages the extensive Christ Cathedral site. EWTN Global Catholic Network will have its West Coast television news and broadcast facility located here and the diocese will house its radio production facility, airing content over Immaculate Heart Radio across Orange County. The ninth floor of the tower will house executive office suites for other worldwide Catholic ministries, including the Augustine Institute, Magis Institute, Dynamic Catholic, Pontifical Mission Society, and other leading organizations. Topped by a 90-foot neon-lit cross, the Tower of Hope was the tallest building in Orange County at its opening and held this distinction for over 10 years. On the top floor is the 130-seat ecumenical Chapel in the Sky, with breathtaking panoramic views of Orange County. The newly renovated temporary worship space for Christ Cathedral parish, offering Mass in English, Vietnamese and Spanish. Known as a titan of mid-century modern architecture, Richard Neutra designed the Arboretum, a 22,288-square-foot structure built in 1962, to serve as the original sanctuary for the Rev. Robert Schuller’s congregation. Rev. Schuller would speak to up to 1,400 churchgoers inside the Arboretum, and walk outside on the balcony to address additional congregants parked in 500 cars, just as he used to do at the drive-in theatre where he first preached. Because of the age and delicate state of the Arboretum, diocesan crews took it down to steel and dirt and conducted extensive renovations, including creation of an innovative and energy-efficient underground air conditioning system. Also completed were seismic strengthening, glass replacement, landscaping and other aesthetic renovations. Since every element was specifically designed by the original architect, the diocese studied archival records to ensure that every dimension and pane of glass matched original specifications. Completed in just six months, the Arboretum’s amazing renovation has won several awards. Currently used as a worship space by Christ Cathedral parishioners, it will function as their home church until the future Christ Cathedral is completed. The 22,288 square foot Arboretum is now temporary home, until the renovation of the Christ Cathedral is completed in 2017, to the over 10,000 members of the Christ Cathedral Parish with Masses in English, Spanish, and Vietnamese. A symbol of the unity of believers and their Church, the cathedral has been central to Catholic worship for thousands of years. A cathedral is the diocese’s “mother church” and the core of liturgical life. 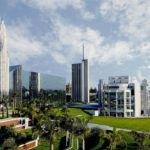 Today the Diocese of Orange is embarked upon an ambitious campaign to transform the historic Crystal Cathedral into the vibrant heart of the diocese, the unparalleled Christ Cathedral. In the late 1970s, legendary American architect Philip Johnson and his partner John Burgee presented their designs for an “all-glass church” to Rev. Robert Schuller. Upon seeing the plans, Rev. Schuller exclaimed, “Wow, it looks like a crystal cathedral!” The building was a massive undertaking, taking over two years to complete. Standing 120 feet tall (12 stories), 141 feet long and 207 feet wide, this 78,397-square-foot edifice is constructed entirely of glass and steel. With 10,660 panes of mirrored glass and seating for 3,000, the cathedral structure is known the world over for its inspiring beauty and breathtaking scale. Johnson Fain and Rios Clementi Hale Studios, respectively, will redesign the cathedral interior and re-sculpt the campus. The monumental task of converting an all-glass church into a space that is intrinsically Catholic and facilitates contemplative and solemn prayer requires inspired action that combines thoughtful accommodation for sacred ministry while simultaneously honoring of the property’s legacy. In the cathedral, the landmark architecture of the building shell will be cleaned and restored. Interior improvements on the main floor and mezzanines will upgrade access, sightlines, finishes and environmental comfort. Interior architecture will be designed to host an array of Masses, celebrations, sacraments, services and non-liturgical events. The historic and internationally renowned Hazel Wright Organ is currently being meticulously restored in Italy. It will be complete in 2017. Acoustics and lighting will be improved and the new cathedral will be open in renewed form to all. The external façade of this globally recognizable building will remain essentially unchanged. The renovated Cathedral will be the new home for the Christ Cathedral Parish (formerly St. Callistus Parish), an active Catholic church with over 10,000 diverse parishioners. "The cathedral will be an international center of faith and evangelization, a vessel for the love of God, a beacon of faith, a home for neighbor and traveler, and a sanctuary for the human spirit." —Bishop Kevin Vann, Diocese of Orange.